12° Morning frost. Mostly sunny. The Hawks have run over the Power with an 11 goal to three final term, to win the game by 72 points. GOAL HAWKSGuerra marks unopposed 35m from goal directly in front, he kicks truly for goal to put his name amongst the goal kickers for the day. The Hawks have kicked 10 goals this quarter and yet they still have time to add to that. GOAL HAWKSLewis stands up Hodge and goes for goal himself and he can tell the captain that he backed a winner. BEHIND HAWKSGunston has a quick shot for goal but can only manage a point. The Hawks will face plenty of headaches at the selection table, trying to fit Roughead and Franklin back into the side. Birchall has been his usual dominating self, with 30 disposals for the game. GOAL HAWKSHale marks in front of Trengove 30m out directly in front and David Hale stamps his authority on the game by kicking his fourth goal of the game. GOAL HAWKSPuopolo hangs out the back of the pack, he gets the ball, plays on and kicks his fifth. It is raining Hawthorn goals at the moment. GOAL HAWKSHodge gathers it inside 50, he kicks a goal in game number 200. Hawthorn by 47 points. GOAL HAWKSSuckling marks 25m out directly in front, he kicks truly and the flood gates have opened. The Power look like they may be a team next year, as long as they get the right guidance, by choosing the correct coach to lead them. The Hawks will be happy with their spread of goal kickers, with most of their regular forwards not playing or in Rioli's case, subbed at half time. GOAL HAWKSThe Hawks get the clearance, as Puopolo runs after the ball, gathers it, kicks around the body and it is through for his fourth goal. GOAL POWERLobbe gathers it on the edge of the goal square, puts boot to ball and it bounces through for a goal. GOAL HAWKSGunston hands it off to Hale in the goal square who kicks his third goal of the day. The Hawks will win this game from here onwards, but the Power have shown a bit today. GOAL POWERSchulz takes the contested mark 35m from goal directly in front, he goes back and kicks his fourth goal of the day. GOAL HAWKSMitchell hands it off to Puopolo, who runs into the goal square and puts the result beyond doubt for the Hawks. GOAL HAWKSGilham marks just inside 50, he goes back and extends the Hawks lead back out to 29 points. The Hawks are starting to get on with the job of winning the game, as they start to look the Hawthorn of old. GOAL HAWKSHale marks 25m from goal on a slight angle, he makes amends for his previous shot at goal by kicking the major this time. GOAL POWERThe Power turn it around as Stewart kicks a goal to bring them back to within 17 points. The Power are back! BEHIND HAWKSHale marks 30m from goal directly in front, he misses a sitter, as the Hawks fans show some frustration. BEHIND HAWKSThe ball is punched through for a rushed behind by the Power defenders. We are back for the final term, with the Hawks getting first hands to the ball. The siren sounds to end the term, with the Power cutting the lead back to trail the Hawks by 21 points at the final break. There is more than enough time left on the clock for either side to score a goal before three quarter time. GOAL POWERBrett Ebert comes out and marks 50m from goal on a slight angle, he nails it, to bring the Power back to within 21 points of the Hawks. SUBSTITUTION POWERThe Power have rolled the dice bringing on McCarthy in place of Moore. GOAL POWERSchulz takes it and runs towards the goal square to kick his third goal of the day. GOAL HAWKSBreust gathers it 25m from goal, he straightens up and kicks his third goal of the day. The Power can't seem to bridge the gap between themselves and Hawthorn at the moment. BEHIND POWERBrad Ebert decides to press his luck for goal and can only manage a minor score. BEHIND HAWKSHale marks 40m from goal directly in front, he takes the set shot, comes in and pushes it across the face of goal for a point. 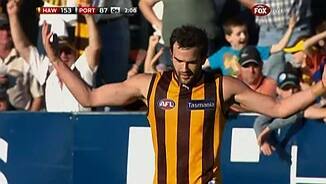 GOAL HAWKSPuopolo gathers it inside 50, he plays on and has a shot on goal restoring the margin back to 27 points. It has been a goal for goal quarter as the Power look to earn back some respect in the football world. GOAL POWERA pressurised kick in the goal square from Broadbent is referred upstairs, the vision is inconclusive and the spotlight is back onto the goal umpire who awards a goal. BEHIND POWERA lazy kick from Suckling results in a rushed behind for the Power. The ball is spending enormous amounts of time inside the Hawks attacking 50m, but nothing is coming of it, as the Power defence have it under control. The scoring has dried up for the mean time, but knowing the way the Hawks play, it won't be long before they get going again. GOAL HAWKSBeautifully picked up by Gunston, who gives it off to Breust and he kicks a great running goal. BEHIND HAWKSSchoenmakers gets it inside 50, puts it on the left boot and just misses. GOAL POWERBroadbent handballs it over to Ebert, who from 45m kicks it around the corner and it sails through for a goal. GOAL HAWKSYoung gathers the loose ball, screws it around the left boot for a goal from 30m out. The Power have started off the second half in the same fashion as it did in the first term. GOAL POWERSchulz is held onto by Gibson and is awarded a free kick 15m from goal directly in front. He slots it through to bring the margin back to 20 points. SUBSTITUTION HAWKSWe are back for the second half and the breaking news is that Cyril Rioli has been subbed out of the game, with Suckling replacing him. The Hawks have kicked away to hold a 26 point lead over the Power after trailing by 13 points at quarter time. BEHIND POWERThe ball comes off hands for a rushed behind for the Power. 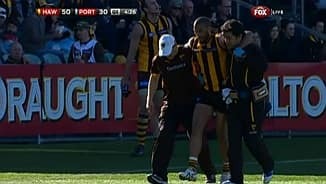 The news seems to get worse for the Hawks as Rioli comes off the ground with a shoulder injury. He may be okay to resume in the second half. GOAL HAWKSHale marks strongly 20m from goal directly in front, he makes no mistake with the shot on goal. GOAL POWERThe Power go coast to coast once again, as Boak runs into the open goal to keep the Power within striking distance of the Hawks. BEHIND HAWKSPuopolo marks it 40m from goal, he comes in and he hits the post. GOAL HAWKSThe Hawks with the quick reply as Ellis gathers it inside 50, has a shot at goal and drills it. Bad news for the Hawks as Gibson is helped off the ground with what appears to be a right ankle injury. GOAL POWERWesthoff with a short pass to Schulz, who marks 15m from goal uncontested, he plays on and kicks a much needed Power goal. The Power are building at the moment, as they look to make up a couple of goals before half time. Both teams manage to have shots on goal and put them both out completely on the full. 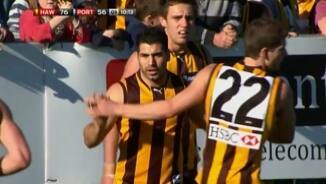 Hawthorn have kicked six unanswered goals in this term, to lead the Power by 26 points. GOAL HAWKSSmith gathers it 45m from goal, he sends it away for his second goal of the game. GOAL HAWKSLewis taps it down to Smith, who kicks it through the pack from 20m out and the Hawks are out to a 20 point lead. BEHIND HAWKSHartlett with a terrible kick in, straight to Puopolo, who marks 30m from goal on the boundary. He does not make them pay, as he kicks a point. BEHIND HAWKSHale marks it 45m from goal on a 45 degree angle, he takes the shot on goal and hits the post. BEHIND POWERBrett Ebert pushes Gibson away, he kicks it around the body for goal and can only muster a point. BEHIND HAWKSSchoenmakers hands it off to Lewis, who looks to run into goal but kicks a behind only. GOAL HAWKSBreust steals the ball from Logan, he gives it off to Puopolo, who runs into the goal square and kicks a goal. The Hawks have totally out played the Power in this second term and are starting to control the game. GOAL HAWKSEllis marks inside 50, he takes his time, he comes in and finally, the Hawks are in front. BEHIND HAWKSLewis gathers and shoots at goal but unfortunately for him and the Hawks it is only a minor score. BEHIND POWERThe Power go coast to coast, as Broadbent unleashes a shot on goal but it is a point. BEHIND HAWKSMitchell marks just inside 50, he has a shot on goal to put the Hawks in the lead and he misses. Scores are level. GOAL HAWKSLewis hands it off to Breust, who kicks a great running goal. The Power would not want to concede the next goal, as the Hawks confidence is building. GOAL HAWKSRioli gathers the ball 55m from goal, he has a shot and drills it. The Hawks are stalking their prey! We are back for the second term as the Hawks get first use of the ball from the middle. The siren sounds to end the first term and the Power go into the first break holding a 13 point lead over the Hawks. BEHIND HAWKSSewell is held onto 50m from goal on a slight angle, he starts it out left and it stays there for a point. 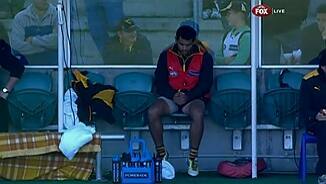 Rioli is in the hands of the trainers, but he looks okay, just a little winded. 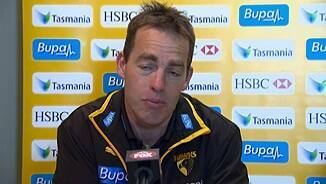 The sleeping giant is awakening, look out Port Power as the Hawks are coming to get you! BEHIND HAWKSYoung has a quick shot at goal, keeping it hard and low, but it goes through for a point. GOAL HAWKSBlee hangs onto Gunston and gives away the free kick 15m from goal directly in front. Gunston kicks through the Hawks first goal of the game. GOAL POWERWesthoff gathers it on the boundary, he stabs the ball through for a great running goal. Power lead by 21 points. The Power continue their good work all over the ground. 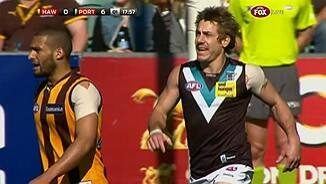 Port Adelaide look like the top four side here today and not Hawthorn. BEHIND HAWKSWhitecross marks 30m out on the boundary, he takes the shot on goal and hits the post. BEHIND POWERPearce roves it well, kicks it around the body and pushes it away to the right. The Hawks are missing their major fire power today, with both Roughead and Franklin missing. BEHIND POWERLobbe sticks his hands up in the air and brings down the mark 20m from goal. He starts it left and it stays there. The Power are letting the Hawks off the hook at the moment. The Hawks need to start their engines as they seem a shadow of the premiership favourite side that they have been all year. 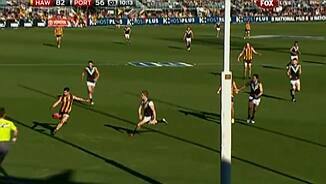 BEHIND POWERSchulz marks 35m from goal, he comes in and pushes it across the face of goal. BEHIND POWERWesthoff comes out and marks 40m from goal, he has a set shot and hits the post. The Power are dominating play at the moment and yes you have read that correctly. GOAL POWERBrett Ebert sneaks out and takes an uncontested mark at the top of the goal square. He comes out and kicks the Power's second goal of the game. GOAL POWERBroadbent works hard to get to the ball, he unleashes a shot on goal from 50m out and splits the middle. The ball is bounced in the middle and we are under way. The subs are Suckling for the Hawks and McCarthy for the Power. 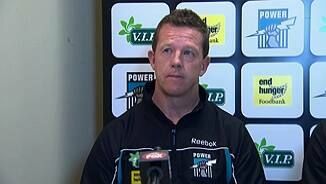 Gary Hocking's AFL coaching career has officially started. Welcome to Aurora Stadium for the match between Hawthorn and Port Adelaide. Both teams have late changes, Gilham replaces Roughead for the Hawks, whilst Pfeiffer replaces Daniel Stewart for Power.